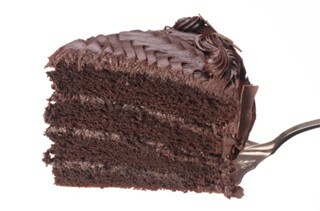 The best chocolate cake recipes are found here at cakerecipes-r-us.com! We have one of the best chocolate cake recipe sections on the web, such as the best moist chocolate cake recipe,a chocolate pudding cake recipe and a chocolate cheese cake recipe. Baking with chocolate is as American as apple pie and chocolate's use in cakes, frostings and fillings makes it an important ingredient for the baker. Chocolate is delicious, rich and soothing to the soul and chocolate cake is one of the most beloved desserts in America. Life would certainly be dull without the endless possibilities that chocolate provides-from a simple fudge cake to a decadent chocolate cheesecake. There are many types of chocolate. Every company's brand is different because they each have a different, special formula which is determined by the blend of the beans, the flavorings and the amount of chocolate liquor and cocoa butter in their chocolate. "Dutch" cocoa is treated with potassium carbonate to raise its pH level. This process produces a darker color and milder taste. The cocoa that most Americans buy at their local supermarket has not been treated in this way; consequently it has a richer, deeper taste than "Dutch" cocoa. Bittersweet chocolate is made up of 35 percent chocolate liquor (made from roasted cacao beans) and about 50 percent cocoa butter with vanilla and sugar added. Semisweet chocolate chips are just bittersweet with a bit more sugar added. The Swiss, who are masters of chocolate making, make the Swiss chocolate and also invented milk chocolate in 1875. Milk Chocolate has about 12 percent milk solids and 10 percent chocolate liquor, but the rest of the ingredients are the same as in bittersweet and the chips. White chocolate is not a true chocolate. It has cocoa butter in it like chocolate does, but has no chocolate liquor in it. It only has milk solids, vanilla, sugar and cocoa butter. Sam German actually invented German chocolate, which is just a sweet version of baking chocolate. Baking chocolate up to that point was an unsweetened chocolate containing only chocolate liquor and a low amount of cocoa butter. The most unique of the list is Belgian chocolate; it's made by hand, not machine. For those of you that like all natural there is organic chocolate available these days. This is made from 100% organic ingredients including specially grown cocoa beans. No matter which chocolate you use for baking or for eating it is definitely a treat. Chocolate satisfies many an ill, or at least we think it does! When baking the best chocolate cake recipes cocoa is better to use than regular chocolate because cocoa has a more intense chocolate flavor. To convert a recipe from chocolate to a richer cocoa cake, substitute 1 Tablespoon + 1 teaspoon cocoa, 1 Tablespoon + 1/2 teaspoon sugar and 1 1/2 teaspoons unsalted butter for every ounce of bittersweet or semisweet chocolate. When melting chocolate for the best chocolate cake recipes it must be done very gently because it will scorch easily. Most chocolate can be melted in a double boiler or a bowl set over hot water. Grating or chopping it before melting will help it to melt evenly. Make sure all utensils used for melting chocolate are dry because any moisture will cause it to become grainy and stiff. Chocolate should be stored in airtight containers (so that it doesn't absorb moisture) at a temperature of 60F-75F with low humidity. It should stay fresh this way for at least two years. Frosting and filling flavors that go well with chocolate cake are vanilla, coffee, chocolate, orange and raspberry. These are tried and true combinations, but feel free to experiment and be creative with different frostings and fillings according to your own tastes. Half the fun is making the cake; the other half is eating it!